Stickybits: How a barcode becomes a very cool online message board – ¿¡ tjongolongo ?! What if walls could talk? Ever wondered what they’d say? Well, maybe now you can find out. No, I’m not saying someone found a way to get a wall to talk, but someone did find a way to tag it with a barcode. 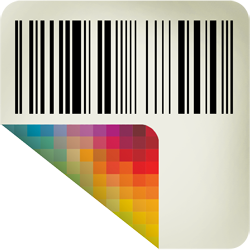 Not just any barcode, a Stickybits barcode. Stickybits is an app for the iPhone and Android that lets you scan any barcode and attach a message to it. You can stick that barcode on the wall, in a book, in the toilet of your favourite club, on a bench in the park, or wherever you like. Other people with an iPhone or Android can in turn scan that Stickbits barcode and see the message you left behind. You can attach photos, videos, music, text, pdfs, zips and more to any barcode. You can buy vinyl stickers from Stickybits with your barcode on it to stick anywhere you want.You can even print your barcode on things like t-shirts, mugs, hats, shoes and office supplies. Tjongolongo, when I first heard about this on the radio, I thought wow, that can be useful as well as fun! I mean, I can stick a barcode on the back of my business card and attach my resume to it. The Stickybits website also suggest you stick a barcode in a birthday card with a video message attached in which you wish the receiver a happy birthday. Or you can attach photos of what you’re selling to a flyer. The ideas are endless. I can even feel an idea coming up in my head for companies to use barcodes in their marketing campaigns. Why not leave a message for me now? 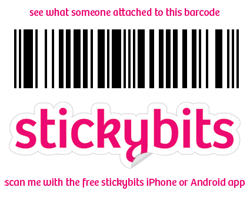 I think the Stickybits are really cool and I would love to use them, however, at the moment I don’t own an iPhone (yet) or an Android. I still want to try it out though that’s why I’ve downloaded a barcode from the Stickybits website attached a message to it and put it in this post and for a few weeks on my blog. What would you use a Stickybits for? How to make a painting come to life?